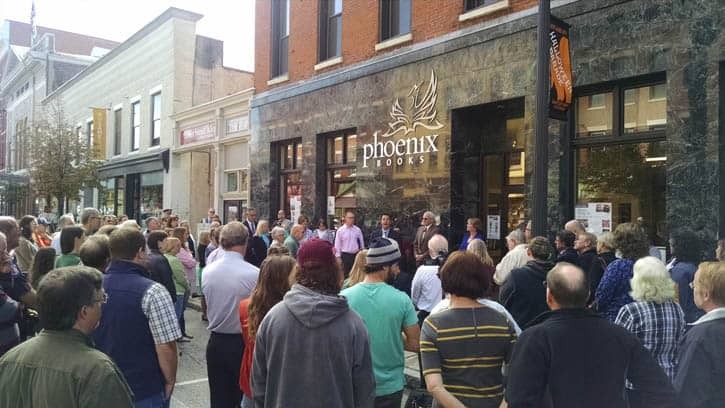 A crowd gathered outside Phoenix Books Rutland for its grand opening, Sept. 2015. RUTLAND — Vermont’s Phoenix Books has been shortlisted for the 2016 Publishers Weekly Bookstore of the Year Award, which highlights singular achievements in the bookselling industry. Phoenix Books opened its third location, in Rutland in September 2015. The company also has locations in Essex and Burlington. “This recognition of our efforts affirms our belief that independent bookstores are valuable and indeed vital to our communities,” added Renee Reiner. Phoenix’s fellow finalists include San Francisco’s Books Inc., Houston’s Brazos Bookstore, Brooklyn’s Greenlight Bookstore, and Bellingham, Washington’s Village Books. The 2016 PW Award winners will be named in late March and will be featured in the April 18 edition of Publishers Weekly. For more information visit www.phoenixbooks.biz.